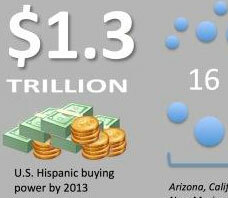 A recent report created by Hispanicize and published by SocialMediadd found that U.S. Hispanics will spend $1.3 Trillion in 2013. The Hispanic market can not be ignored in any advertising campaign. The upcoming presidential election will be determined by the Hispanic vote and the ad campaigns for the candidates. The recent report by Hispanicize identified the following statistics that will play a pivotal role in how companies market their products and services in the United States. "The Hispanic market can not be ignored in any advertising campaign. The upcoming presidential election will be determined by the Hispanic vote and the ad campaigns for the candidates." SocialMediadd offers affordable social media marketing services for businesses that are looking to increase their presence on Facebook, Twitter, and YouTube.